petty actions have been approved according to a memo from the CDCR. 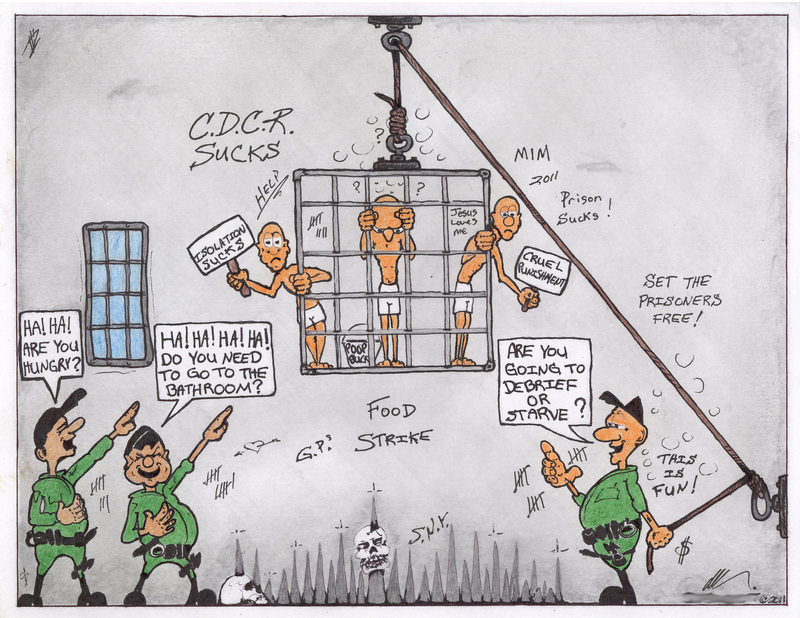 As thousands of prisoners wrap up day five of round two of the California Food Strike, the California Department of Corrections and Rehabilitation (CDCR) has stepped up its repression and propaganda in response to prisoners' demands for basic humyn rights. They have even declared it a punishable offense to peacefully campaign the state for these rights by refusing state-issued food. 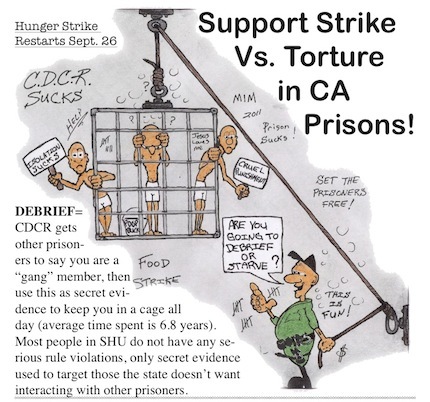 The bourgeois press has been repeating the CDCR's ridiculous claim that if prisoners went on strike again it might delay reforms in the SHU system. Their audacity is laughable. We all know the strike is nothing but a scapegoat, and not the cause of their "delay." Meanwhile, they have indicated that they will make conditions worse on three main points of the original Five Core Demands. All three points address the systematic repressiveness of the whole California prison system. 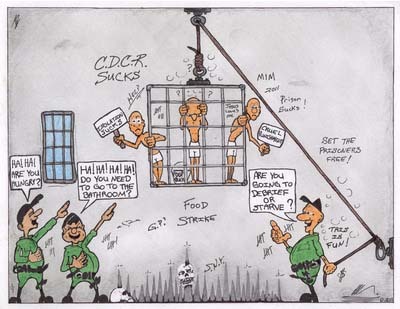 MORE GROUP PUNISHMENT - Not only has the CDCR threatened that reforms will be slowed down by another round of hunger striking, but they have implied that non-striking prisoners will also lose their programming as a result. (1) This is in direct contradiction to the first demand. 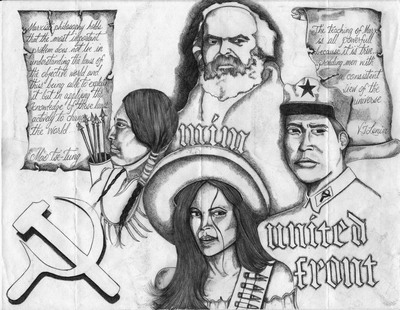 MORE SECURITY THREAT GROUPS - While the prisoners have demanded an end to the arbitrary and secretive system of giving people endless sentences in the Security Housing Units (SHU, long-term isolation) for "gang affiliation," the CDCR has publicly discussed broadening the "Security Threat Group" category to include street organizations. This will mean more people in SHU for indeterminate sentences. MORE LONG-TERM ISOLATION - The third demand calls for an end to the torturous practice of long-term isolation. While the state has continued to assert that these practices are constitutional based on court rulings, they have promised to send more prisoners to Administrative Segregation and SHU just for participating in the hunger strike! As laid out in the Five Core Demands, these are parts of a system of oppression that affects all prisoners. While comrades in SHU have the drive to put it down hardest because of their living conditions, the CDCR is making it clear that the implications will affect the whole system. Even the reforms offered in the Gang Management Policy Proposal of 25 August 2011 allow the continued practice of keeping the most progressive and politically active prisoners in isolation indefinitely. (2) While this would put California more in line with what is done in most other parts of the country, it is hardly progress. 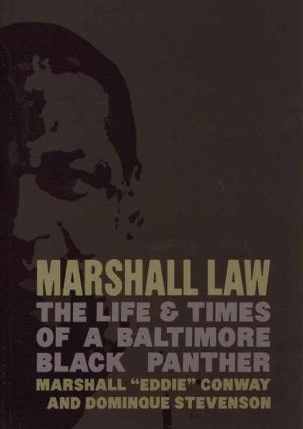 This proposal highlights the political nature of the injustice system. 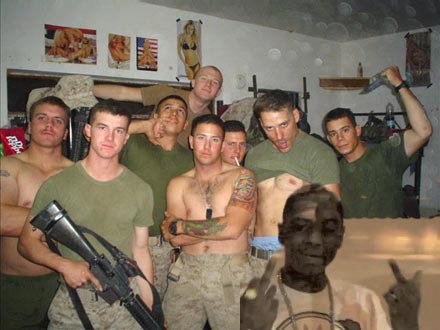 Even the Eight Short-term Action Items affecting prisoners in Security Housing Units listed in a 27 September 2011 CDCR memo(3) may not be granted to prisoners refusing to eat state-issued meals. 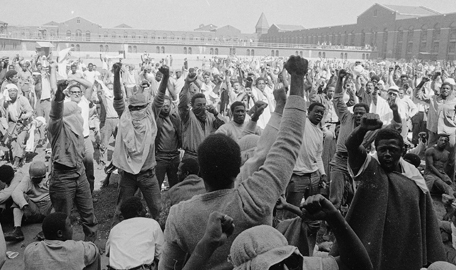 They hope that by granting the more petty demands that they can break up the unity of California prisoners, convincing some to give up while they are ahead. The unreasonable actions of the CDCR during this whole conflict should convince any prisoner that such a move would be a mistake. There is no indication that California will be reducing its repression, and every indication that it hopes to heighten Amerika's war on oppressed nations. Inmates participating will receive disciplinary action in accordance with the California Code of Regulations. Inmates identified as leading the disturbance will be subject to removal from general population and placed in an Administrative Segregation Unit. In the event of a mass hunger strike, additional measures may be taken to more effectively monitor and manage the participating inmates' involvement and their food/nutrition intake, including the possible removal of canteen items from participating inmates. All inmates are encouraged to continue with positive programming and to not participate in this or any other identified mass strike/disturbance. 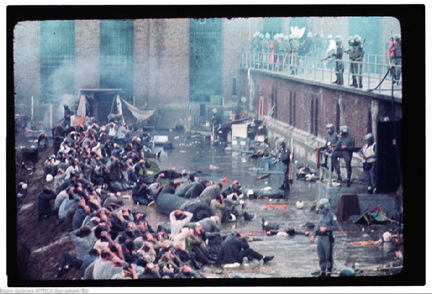 These types of disturbances impact inmate programming and day-to-day prison operations for the entire population. While every effort will be made to continue normal programming for nonparticipating inmates, a large scale disturbance of this type will unavoidably impact operations. The Department will notify inmates and families when and if normal programming is impacted. Authorization of watch caps for purchase and State issue. Authorization of wall calendars for purchase in canteen. Authorization of exercise equipment in SHU yards (installation of permanent dip/push-up bars is still under review). Authorization of annual photographs for disciplinary free inmates. Approval of proctors for college examinations. Use of California Department of Corrections and Rehabilitation's (CDCR) Ombudsman for monitoring and auditing of food services. Authorization of sweat pants for purchase/annual package. Authorization of Hobby items (colored chalk, pen fillers, and drawing paper). As noted above, the Department is conducting a comprehensive review of SHU policies that includes behavior-based components, increased privileges based upon disciplinary free behavior, a step down process for SHU inmates, and a system that better defines and weighs necessary points in the validation process. The initial policies will be completed shortly and upon Secretary approval will be sent for stakeholder review and comment. Upon receipt of this input, the Department will initiate any regulation changes in the administrative law process necessary and implement the first major changes to the validation process in the last two decades. Of course this work may be delayed by large-scale inmate disturbances or other emergency circumstances. CLICK IMAGE TO DOWNLOAD flier to print and distribute. Let us know what you're doing to support the strikers.